It’s one thing to have to deal with one person at work who uses passive-aggressive tactics, but what do you do when your workplace culture actually promotes this type of dysfunctional communication and behaviour? Do any of these situations sound familiar? Saying things about someone behind their back that one would never say to their face. Ignoring or delaying responses to requests. And the granddaddy of them all… not giving an employee frank feedback, then allowing them to flounder until they’re fired. As maddening as passive-aggressive behaviour is, the real problem is that it’s contagious. Passive-aggressive behaviour provokes a passive-aggressive response and brings out the worst in all of us. The irony, however, is that we rarely notice how our responses to passive-aggressive behaviour perpetuates a passive-aggressive culture. Here’s how this dysfunctional behaviour spreads. When people don’t feel like they can be candid with others, sooner or later, they end up demonstrating passive-aggressive behaviour which provokes others to respond in kind. All the while, neither party knows exactly why the other is behaving this way. They both naturally assume that it’s because the other person is a jerk. Have you seen this cycle play out in your workplace? Can you see your part in perpetuating this cycle? The linchpin of the Passive-Aggressive Cycle is the feeling that you can’t give someone candid feedback. Remove the fear of giving feedback and you break the cycle. But before we go there, take a moment to consider how your behaviour may be contributing to the Passive-Aggressive Cycle in your workplace. Think of someone that you want to give feedback to but feel you can’t. Have you exhibited behaviour towards them that could possibly be interpreted as passive-aggressive? Once you identify how your behaviour may be perpetuating the Passive-Aggressive Cycle in your workplace, decide now to stop that behaviour. It is just as important to determine what you need to stop doing as it is what you need to start doing. 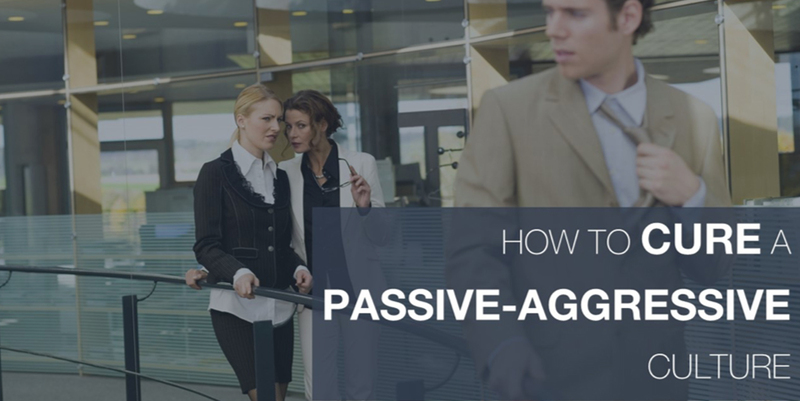 Now, continue reading for some thoughts about how to cure a passive-aggressive workplace culture. Most of us have not had an overabundance of positive examples when it comes to giving and receiving feedback. In high school we received report cards but our teachers rarely reviewed them with us. In university we received letter grades but would be lucky to get a few minutes with the professor for some helpful tips on how to improve. And it doesn’t take long after entering the workforce before accumulating numerous examples of managers who delivered feedback poorly or simply didn’t provide any at all. Unfortunately, outside of the cozy confines of our family, we don’t have many great examples of authority figures providing us with effective, helpful feedback. Believe it or not, most employees want corrective feedback from their managers. In fact, 72% of employees believe that their performance would improve if their managers would provide corrective feedback. The problem is, almost half of managers (44%) fear giving it. In addition to the dearth of feedback-giving exemplars in our lives, leadership development consulting group Zenger Folkman provides another reason why people fear feedback. Their research uncovered a strong correlation between a person’s level of confidence and his or her preference for giving and receiving corrective feedback. This means that confident people are generally more comfortable giving and receiving feedback, and less confident people are generally less comfortable giving and receiving feedback. This finding should not be surprising. People who are more sure of their strengths are secure enough to shine a light on their weaknesses. And insecure people are generally less willing to say something that may hurt their likability. The very essence of leadership is to “go before” and guide others to a destination. The way managers guide others is by constantly pointing to the destination and providing frequent feedback about how well individual efforts are moving the team closer to the destination. Let me be frank, if you are a manager and you avoid giving others feedback (or sugar coat it when you do), you are the primary cause of your team’s poor performance. Much of employees’ poor performance can be traced back to a leader’s failure to point to the destination clearly and frequently enough, and to provide enough unambiguous guidance on individual and team performance. Unfortunately, most managers are delusional about how well they provide feedback. For example, I recently met with an employee who told me she had the distinct impression that her manager holds back and doesn’t really tell her how he feels about her performance. An hour later I met with her manager who declared to me that everyone on his team knows where they stand with him. This disconnect between a manager’s perception of how well they provide feedback and reality is quite common. In a survey of over 11,000 direct reports, Zenger Folkman asked employees how effective their managers were at providing honest feedback on a regular basis. Only 7% gave their managers high marks. So what’s a manager to do? If you are a manager and know that you are uncomfortable providing corrective feedback, then you have three options. Take a hard look at your strengths and weakness, and if you think you can become better at providing effective feedback, include this in your personal development plan. Take a hard look at your strengths and weakness, and if you don’t think you will ever become good at providing feedback, look for a different career path. You don’t want to spend the rest of your career failing at one of your essential managerial duties while also contributing to a dysfunctional and frustrating work environment for your team members. Don’t take a hard look at your strengths and weakness—keep your head buried in the sand like far too many managers do. Managers must set the example by improving their ability to provide honest, clear, and respectful feedback. When they do this, the rest of the organization will learn from their examples and fear feedback less. 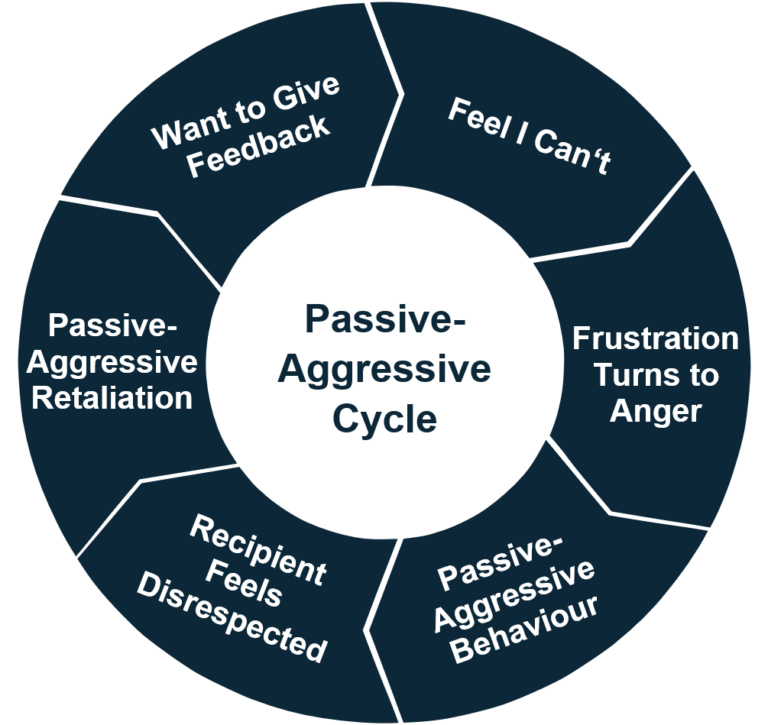 As more people become comfortable giving and receiving feedback, the Passive-Aggressive Cycle will dissipate creating an environment where a culture of accountability can flourish. Michael Timms is founder of Avail Leadership – a leadership development firm that specializes in helping organizations implement world class people development.